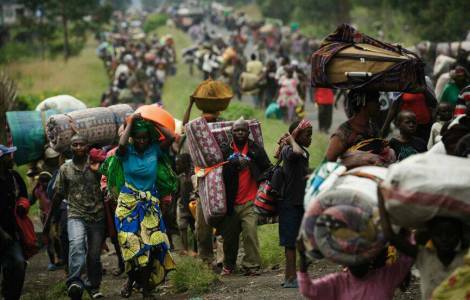 Kinshasa (Agenzia Fides) - Violent fighting has caused victims and are pushing the population to flee from the highland villages of Uvira, in the province of South Kivu, in the east of the Democratic Republic of Congo. The complaint was made, in a communication sent to Agenzia Fides through missionary sources, the local NGO, ACMEJ/DH, according to which "in several villages of the BIJOMBO groupement in the Bavera chefferie - Kanono, Rubibi, Kihuha, Rubarati, the fighters of the Gumino armed group of the Congolese Banyamulenge community, allied with the Rwandan rebels of General Kayumba Nyamwasa clash with the Mai-Mai fighters, allied with the rebels of Gofroid Niyombare". The violent fighting has caused a massive movement of the people fleeing from the fighting area. ACMEJ/DH states that the armed groups that are fighting have their bases in the Ruzizi Plain and in the nearby Fizi Territory. "According to local analysts, these events are part of the same Balkanization project that has been carried out for some time, in order to divide the DRC, annexing Kivu to Rwanda, or turning it into a separate State from the rest of the DRC", says ACMEJ/DH that judges these projects "unacceptable for the Congolese in Kivu". "Why do the Congolese in the Democratic Republic of Eastern Congo continue to ally with foreign rebel groups?" asks ACMEJ/DH. "The President of Rwanda Paul Kagame is the leader of these rebel groups but they deceive the Congolese people by telling them that their goal is to overthrow the regimes of Rwandan Paul Kagame and that of Burundi President Peter Nkurunziza. If so, if they have the same mission, why do they fight each other? ", asks ACMEJ/DH, suggesting that the real purpose of these clashes is to sow chaos to force local populations to flee. Once the area is freed from its inhabitants, it can be robbed of its resources: gold, coltan, timber, tin and more.